This issue picks up where the last one left off. The Doctor, along with badass, revenge-minded Amazon warrior Rani, and Prinyanka, the daughter of one of the Doctor’s old time travelling buddies, search for a way to defeat the ancient Indian death cult that is currently trying to crash a continent sized spaceship into the surface of the Earth, killing millions of people in the process. That’s the kind of thing secret death cults are prone to do we guess, but someone has to feed the necro-cloud we suppose. Dealing with four-dimensional monsters and sprawling conspiracies is bad enough, but Clara is having some problems of her own. As you remember from last time, she’s now playing host to Kali, the goddess of death and ruin, and she has morphed into a stories-tall, multi-armed deity, and turned blue in the process. Not to mention she has an insatiable lust for murder and destruction. Good thing she’s tough as hell, it’s hard to keep the Impossible Girl down for too long, even for a goddess. Because this is the concluding chapter of the latest story arc, it reads like a final act, as a climax. All of the primary character work and the story development that needs to be done already happened in the previous issues, and as a result, issue #5 unfolds at a high-speed, rapid pace. You straight up run from start to finish, and it’s fine, and necessary, but as a standalone issue this feels a bit light on substance. It’s best if you read it with the earlier chapters—you have to imagine this arc will be collected in a single volume at some point, which will probably be the ideal way to consume this. And you should, because there’s a lot of cool stuff to this story, but this last piece of the puzzle is simply all go, without much else. There are themes of revenge, and overcoming those dark impulses, woven into the story, especially with Rani, who, even flung hundreds of years into the future, is still bent on enacting a bit of vengeance against those who killed her lover. But, like so much else with this arc, most of that groundwork was laid before this issue. You also briefly touch on the dangers of religious extremism, and in true Doctor fashion, he cautions against any and all overly zealous interpretations of faith, no matter what doctrine you follow. But that’s all pretty light. 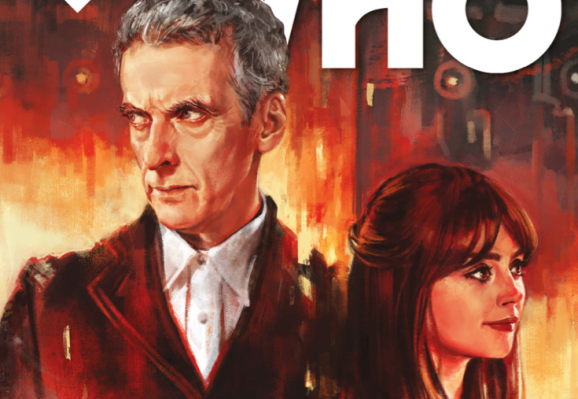 Overall, if you’ve been keeping up with The Twelfth Doctor, issue #5 is a fast-paced, satisfying conclusion to this particularly adventurous storyline. However, if you’re looking for a place to jump in, you might want to go back a few issues to get the whole story, or perhaps just wait until issue #6, as this isn’t representative of what this particular title is doing in a narrative, character, or emotional sense.